The first season of Orphan Black, BBC America's cloning conspiracy thriller, comes out on DVD this week, and everyone who hasn't watched it yet needs to pick up the discs and start binging now. Over just 10 episodes, Orphan Black has become our newest scifi obsession, and here's why. The real clone wars begin in This Week’s DVDs! Orphan Black stars Tatiana Maslany as, well, a lot of people. But initially, the show centers on Sarah Manning, an orphan who has just returned to Toronto to reunite with her daughter, Kira (Skyler Wexler). As soon as she arrives, though, Sarah witnesses the suicide of a woman who looks exactly like her. Desperate for money and an escape from her drug-dealing ex-boyfriend, Vic (Michael Mando), Sarah steals Beth's identity, conning everyone in Beth's life. But as she delves more deeply into Beth's life, Sarah learns a shocking secret: she and Beth are clones, and there are a whole lot more of their genetic identicals running around. We've been burned by a lot of television shows that revolve around big, conspiratorial mysteries. But Orphan Black, from its frenetic pilot onward, never feels like it's pulling the wool over our eyes. We're not thrown mystery after mystery; instead, every time we learn something new about Sarah's strange new world, it feels like we're peeking into an ever-widening portal. In the early episodes, Sarah is concerned with money and her own survival, and even that makes for exciting television; Sarah bluffs and smiles and often escapes tense situations by the skin of her readily flashed teeth. She's quick on her feet and utterly shameless. But just as Sarah is getting comfortable with her con, the story swerves into a land of religious fundamentalists, ethically challenged researchers, and a group of women trying to understand what it means to be a clone. Just as we think we're beginning to understand who all the players are, a new chess piece is unveiled, making the game more complicated, but never confusing. The stakes are always being raised on Sarah and her fellow clones, and there are always new challenges for them to face. It's also a show that rewards close viewing, dropping little hints about the characters along the way. The show is also smart enough to realize that the most chilling revelations aren't the ones where the characters learn that someone is out to get them or that they were born thanks to some shadowy organization. It's far more disturbing to learn that their lives aren't as private—and their relationships aren't as intimate—as they thought they were. It's one thing to learn that strange people are interested in you. It's another to learn how they know everything about you. Orphan Black doesn't always get all the science right, but it takes a very serious, thoughtful approach to human cloning. These women may be genetically identical, but each one is unique, the product of different wombs, different environments, different biological and social events. It's telling that the producers went to the effort to cast an actress who could inhabit so many different characters. Some of the characters in Orphan Black might have difficulty seeing that clones are individual people (or people at all), but we in the audience never do. 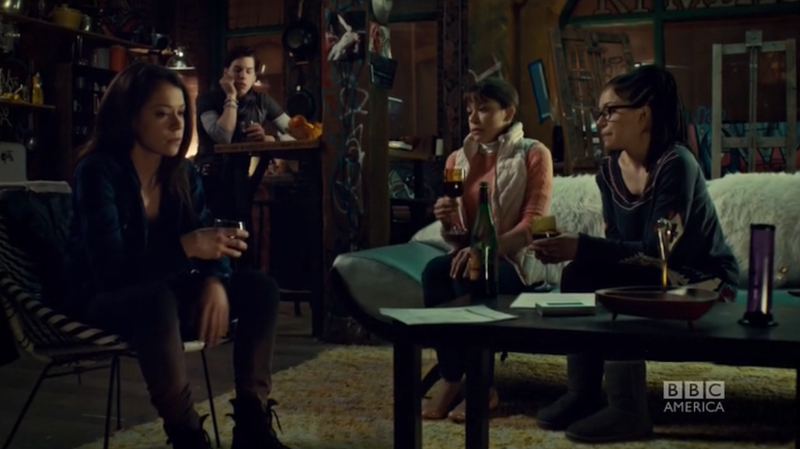 While there are a few mentions of the road not traveled, Orphan Black isn't interested in asking "What if Sarah had been raised a different way?" Sarah is Sarah, and she's not Alison, not Cosima, not Helena—and she never would be. They're all different people, just as non-cloned people are. Instead, in focusing on a clone who also happens to be an orphan, Orphan Black makes its cloning story ultimately about the nature of family. At the beginning of the series, Sarah's sole concern is her one known genetic relative: her daughter. But as her genetic family expands, Sarah finds herself developing familial relationships, and not just with her fellow clones. Her new experiences color her relationships with her foster mother, Mrs. S. (Maria Doyle Kennedy, The Tudors' Katherine of freaking Aragon), and her foster brother, Felix (Jordan Gavaris). It's also wonderful to watch a character like Felix, a man whose defining quality is that he's a true blue brother to Sarah and any other woman he claims as a sister. This focus on the nature of family makes Orphan Black more than a mere conspiracy show. It's a character drama, and we're engrossed not just in the various mysteries, but also the women at the heart of them. They're not always wise or good, but each of them is filled with love and doubt and pain. And in a show about cloning, don't we want to know our cloned characters intimately — their similarities and their differences? When I started recapping Orphan Black, a lot of readers here were uncertain about following the show. They thought it was smart and well-written, but they weren't so sure they wanted to follow the adventures of Sarah, who is selfish, reckless, and probably not worthy of her daughter. At first, you kind of root for Sarah because you want to see what kind of hot water she'll land in next, but as she becomes more engrossed in the world of cloning, she proves herself a competent leader with a core of steel. She becomes the kind of person she never thought she would be. Because it's a conspiracy show, Orphan Black is filled with characters who have blinking neon skeletons lurking in their closets. The show actually does a great job of messing with its audience, making us doubt this character's motives or wonder if we've been too quick to judge another. But it's not just the secret-holders who surprise us; it's the ordinary people pushed into extraordinary circumstances. Alison, the soccer mom of the Clone Club, is particularly fun in this regard. What happens when you take a Type A suburbanite who probably thought that her most stressful challenge would be getting her kids into a good college and then plunge her cardigan-deep into a web of violence and deception? I'm sure that she never thought that she'd be using a glue gun as instrument of torture. There's a wide streak of black comedy running through Orphan Black's DNA. Occasionally, people will separate from their body parts in surprisingly hilarious ways, though the genuinely horrifying moments of violence are shocking and sober. And after Alison, our once straight-laced suburbanite, is driven to the edge of her sanity, we'll never look at a craft room the same way again. The show also has a healthy sense of humor about itself. In an early episode, Cosima and Sarah find themselves seated at the bar where the bartender nods at each of them and quips, "Let me guess: You're the smart one and you're the wild one." There are a lot of great lines like this, where Orphan Black pokes fun at itself and the tropes that it employs. Maslany is the star of Orphan Black many times over, but that's no reason to ignore the talented supporting cast. Kennedy creates a Mrs. S. whose sternness seems derived from a genuine frustration that her foster children didn't turn out as she had hoped, and her scenes with Maslany are weighted with a sense of their shared history. In the early episodes, we feared that Gavaris might come off as the gay comic relief, but he quickly goes from eye-rolling snarkster to the best friend a cloned girl could want. Matt Frewer (of Max Headroom, and more recently, Eureka and Falling Skies fame) is terribly fun as Dr. Aldous Leekie, a transhumanism advocate Cosima encounters. And Mando plays drug dealer Vic as almost endearingly unhinged: one moment a violent drug dealer, the next weeping over his love for Sarah. Some of the characters snuck up on us as the season progressed; Inga Cadranel's Detective Angie Deangelis swung from an extremely minor character to a significant secondary player with wonderfully morbid interests. We're excited to see what's in store for her next season. We've already listed our reasons why Maslany deserves an Emmy nod, and we stand by them. The visual effects on Orphan Black do a wonderful job of creating the illusion that Maslany's characters are really all in the same room. The editing is also masterful; I didn't realize how infrequently two clones' faces appear in the same frame until I found myself hunting for good screenshots each week. But it's Maslany's performance that makes the illusion complete. She makes each clone an individual, with her own posture, gait, mannerisms, and dialect, most of them burning with an intense desire to be loved and a fierceness they'll need to survive. It's hard enough for an actor to create one fully realized character; Maslany has created half a dozen within the same world, and it would be impossible to confuse any two of them. In fact, what makes her performance so impressive is that she frequently plays the clones impersonating one another — Alison pretending to be Sarah, Sarah pretending to be Alison, Helena pretending to be like whomever she feels like that day—and yet it's always clear which character she's playing. It's impressive as an acting feat, but it's also a key aspect of what makes Orphan Black so enjoyable. Maslany does not demand our suspension of disbelief. She lets us enjoy Orphan Black as if the clones were played by different actresses who happen to look alike. And in a show about women who look nearly identical but aren't, that's exactly what we want.